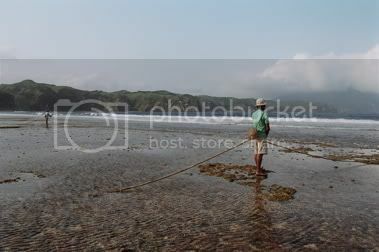 It was almost five in the afternoon, and the tide was retreating to expose the jagged edges of the shallow shores of Centro on the Island Municipality of Sabtang. The last falowa from Ivana which lies across the treacherous Balintang Channel had just arrived, unloading a few passengers and several cartons of a vile, clear and burning poison called gin – a commodity which on these islands is said to be more valuable than rice. At about this time, young Ivatans were gathered in scattered groups around the pier. They were engaged in an awkward cotillion, taking little strides to the left and to the right, forward and backward, in their attempt to catch a whiff of the elusive mobile phone signal which seldom blew their way. 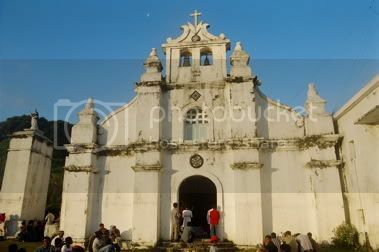 Some were even perched on top of their homes – humble stone houses with meter thick cogon roofs – their arms raised to the heavens, like the outstretched rays of the waning sun which crowned the hills overlooking Centro in a blazing fury of red. The bars on their mobile phones rose only momentarily. For some fortunate to have pressed the right buttons, it was enough to send one message, or to receive an SMS. Hardly was it ever enough to place a call. 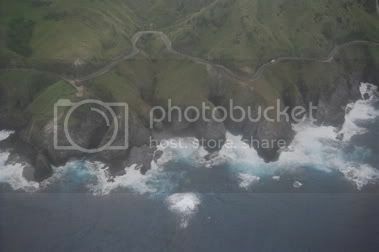 These are the Batanes Islands; like drops of seeds, they are sprinkled carelessly, perhaps too far north of mainland Luzon where the Pacific Ocean and the South China Sea fuse. The union is marked often with great violence, and the province is known for the unpredictable natural movements that result from the collision of these bodies of water. 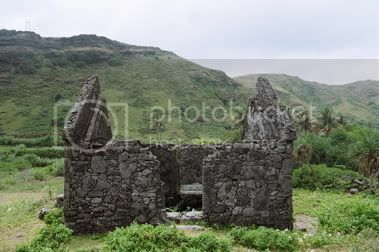 Despite the punishment waged by the forces of nature, Batanes is home to the sturdy and peaceful Ivatans, a people descended from generations of industrious survivors. Not unlike their stone houses, they are known to withstand punishment of the most brutal kind. All ten of the Batanes Islands are so small that they are often forgotten in some maps of the Philippines. And yet, in so packed an area and so distant a place are found perhaps some of the most enchanting natural and cultural attractions in this archipelago. Reaching the province is itself wrought with details deserving of an altogether different story. How I came to a decision to travel alone to a land filled with mystery and wonder becomes trivial considering the wealth of experience one draws from a day with the Ivatans. Although regular flights now ply the Manila-Basco route, my penchant for misadventure encouraged a more tiring and unpredictable mode. I decided to take the long haul to Tuguegarao and fly onboard an 8-seater plane. The idea immediately infused me with excitement, but it could not compare to the delirious feeling – due perhaps to a little panic and a lot of surprise – which possessed me when I saw the small twin engine plane getting a last minute check-up on the tarmac. I was almost certain it would not fly. But it did, with a consistently loud roar as we flew steadily over the Babuyan Islands and the long expanse of sea. I was the only visitor traveling on the plane. The expensive, noisy and bumpy ride was nothing unusual for the other passengers, all of whom were returning. 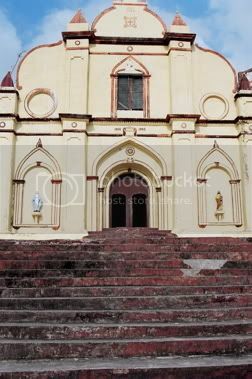 We reached the capital municipality of Basco on the island of Batan with little incident. 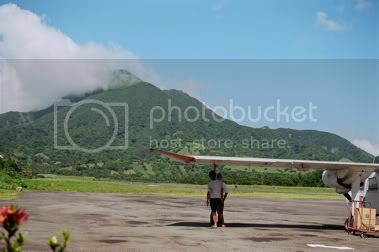 The plane made a wobbly approach to the short runway of the Basco airport, which ended on a slight upward slope at the foot of Mt. Iraya, a dormant volcano, whose summit is perpetually swathed in a collar of thick clouds. Not far away were fields planted with an assortment of crops, chiefly corn, and an herd of goats grazing on a hillside. I arrived in Batanes armed with the knowledge that many have journeyed to the islands before me, and many more will come after I have left. Trails have been blazed and itineraries have been fixed. There is little left for me to discover; I planned only to follow the beaten path in order to find myself. Solitary journeys are always rife with opportunities to reflect and to be circumspect, and as I allowed myself to be lured to one of my many musings, the loud chugging of a tricycle broke me off. Without my asking, the airline’s clerk arranged for a ride to take me to the Ivatan Lodge. The appeal of these islands, as the days that followed revealed to me, was not limited to its savage natural beauty alone, but also to the unconditional goodness of its inhabitants. When I had dinner on my first night at Shanedel’s Inn, a bed and breakfast with a fantastic sunset view overlooking Batan Bay, and which stood just beside my lodging house, I had my first sampling of that uniquely sincere and warm Ivatan hospitality. 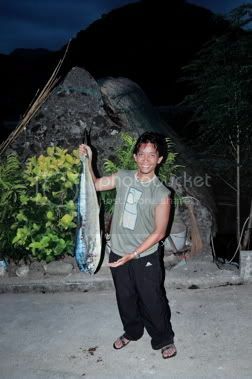 Noticing that I was taking apart the huge steamed flying fish alone, a group of local boys invited me to join in the racket they were making. They were crooning songs old and new. Back home, many of these songs ignited brawls. Another group arrived a little later and asked to share the microphone. I was introduced to everyone, and knew for certain that I would not remember any of their names. The following day, many of these people would talk to me as I strolled along Batan’s narrow streets, and little did I realize that I was in the same table as they just the previous night. One of the visitors to the Inn that night, however, was the province’s resident presiding judge. 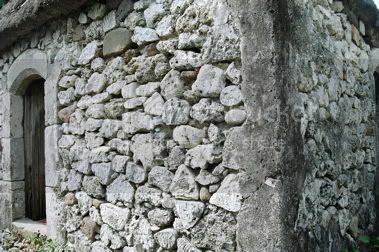 As his companions struggled through some antiquated tunes, he said that working in Batanes felt a little like being on retirement, particularly because the Ivatans were not litigious folk. They are a peaceful lot, he shared, much unlike the weather. His entire caseload was a little over seventy. In some courtrooms in the City of Manila, a larger number may be scheduled on any given day. That same night, I fell asleep in another person’s house. One of the locals invited me for another round of drinks at another venue, and although I politely declined the deceptively small bottle of Red Horse, I could not resist the temptation to experience the Ivatan way of life. I think I had a bottle too many and I woke up the following morning with a cleaving headache in a strange house I did not remember going home to. So this was how it was like to have been kicked by a red horse. Sleeping at places outside my house of lodging became normal fare for me as my solitude became a ticket to many invitations. I was not one to decline the opportunities. 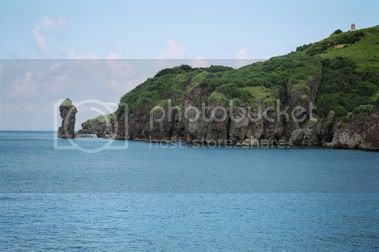 When I crossed Batan Island to visit Sabtang, my plans to gallivant around the island municipality went awry when a family invited me to join a birthday celebration. “Stay for the night,” they said. Some guests even brought with them woven mats and blankets. They apparently had no intention of returning to their homes once the drinks made their rounds. At noon, the generators are turned on, and electricity will last for the next twelve hours, a luxury the people on Sabtang have had only recently. Lunch had yet to settle in when glasses begin to pass many hands and lips as a box of gin waited consumption. Ivatan stomachs are made of steel. They gulp down their shots without chasers. They are even less interested in beer, which I nursed for many hours to avoid being offered the clear concoction. There was certainly no way I could outdrink any of my hosts, even the minors. Despite their very humble circumstances, many Ivatans willingly open their doors to visitors. When lunchtime found me looking at the oldest standing house in the town of Ivana – a squat structure which is said to have survived a devastating earthquake – I looked around for a place to eat, but failed. I asked a storeowner if there were canteens in the area, and he said there were none. I decided to buy a can of tuna and some bread. “Have you had lunch?” he asked, and I said no. “Have lunch at my house.” He escorted me to his home, opened my can of tuna, and served me a plate of vegetables and more than enough rice. The latter two were given to me free. He excused himself because he had to tend to his store and apologized that he could not stay any longer. “Anyway my wife is here if you need anything,” he said before leaving. As I embarrassingly ate lunch, the storeowner’s wife regaled me with stories about their trials and tribulations in the big city that I call home, which culminated in their decision to return to Batanes and live for good in the islands. When I finished, they asked that I return the following day for lunch. “I’m sorry we only have vegetables,” the woman said. “My brother’s catch this morning wasn’t good. Tomorrow, we’ll have dorado fish,” she enthused, but I was already too ashamed to return. I had a photograph taken with my kind hosts and I had them write down their address. I promised that a copy would be sent as soon as the film was developed. “That’s alright,” I replied. “I’m used to walking.” Which was not untrue at all, and nowhere else was it more appropriate. Batanes is perhaps the only place in the Philippines where the entire province can be explored on nothing but a pair of strong legs. Scooters and motorbikes are the preferred mode of transport, but jeeps are also available, although they come far and few between. On Batan Island, the public jeepneys, which probably number less than ten, ply the Batan-Itbud routes. They go chiefly along the National Highway at intervals of less than twenty minutes to as much as over an hour. 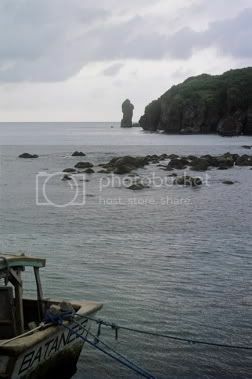 In Sabtang Island, it is said that only two jeepneys travel the route around the circumferential highway. Walking was definitely a much better option. On my way, I find four other hikers who were also lodged in the same dormitory as I. I decided to join them. Our trek took us past the Chavayan Marine Sanctuary where we had our early lunch. 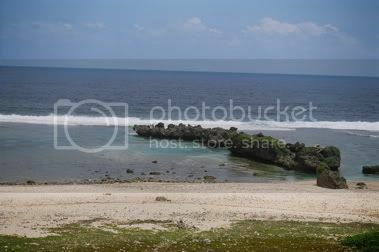 The beach is a short strip of white sand decked by modest cliffs. There are natural breakers on either edge of the sanctuary, pounded eagerly and endlessly by huge waves. 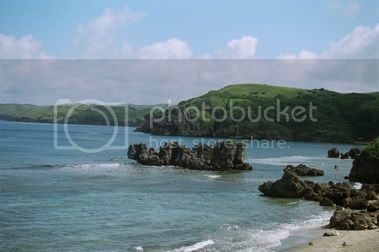 One might think that the brutal quality of the Batanes landscape is born mainly from the collision of these natural forces. The waters are merciless in their assaults, but the landmasses are stubborn in their unyielding surrender to the surrounding siege. In Chavayan, a picturesque town where rows of stone houses still line the narrow cobblestone streets, my companions and I looked for the most unusual thing: ice cold soda. None could be found in any of the three stores which carried very limited provisions. The lady tending one of the stores noted the disappointment in our faces, and she quickly peered outside her window and shouted something in the local dialect to the young boys playing basketball at a nearby court. The Ivatan language is the strangest sounding Philippine dialect I have ever heard, and yet, the Ivatans speak Tagalog with no noticeable accent. Shortly after the storeowner apologized for not having any cold drinks, the boys were knocking at her door with some freshly picked coconuts. Kids lugging very cold water also rushed to the well-kept lawn fronting the Chavayan Parish Church where we had decided to rest. We cheerfully drank fresh buko juice and refilled our empty bottles. When we asked how much the coconuts were, the boys who picked them walked away, almost blushing. They were not expecting to be paid at all, but we insisted; after all, we disturbed their game. That afternoon, I planned to return to Batan, but the waves were turning ugly and no pilot would dare ferry passengers across the treacherous channel. Another group of tourists was particularly insistent and had offered to pay more than the usual. The bribe failed to convince anyone, but when they pleaded that they might miss their flight early the following day, one young boatman agreed. 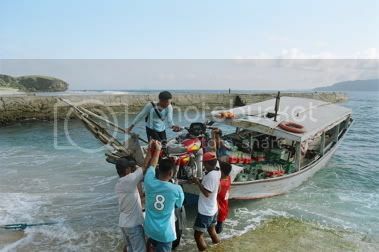 The falowa had barely left the port when its rounded belly scoured the exposed shallow reefs of the port of Sabtang and capsized with comical misfortune. The passengers screamed for their lives only to realize that there was not enough water to drown any of them. Miserable and soaked, they walked back to the beach amid knowing stares from many of the locals who advised against the trip at so late an hour. 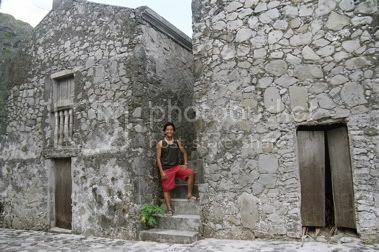 Batanes is truly a place of many unpredictable, at times serendipitous, happenings. In my case, the most unexpected thing happened one night as I decided to venture out for an after dinner walk near the pier. The moment I stepped out of the Ivatan Lodge, I found a giant blue spider, clawing at the door. I called the guard and he shrieked, “Tatus!” It was in fact the coconut crab, a huge crustacean which seemed like a cross between a lobster and an arachnid. It had large and powerful pincers and a fat round belly. Initially, I thought of the idea of bringing the find with me back home, but the guard suggested that we just eat it instead. He quickly boiled water and dropped the struggling crab into the cauldron. “You’re very lucky,” the man said, as he served the coconut crab on a plate. Tatus is an expensive and rare delicacy. The blue had been replaced by a very deep pink, and when I scooped inside its belly, I found a recipe for a heart attack: huge amounts of cholesterol-rich and tasty crab fat derived from the creature’s exclusive diet of coconut. As I debated whether I should take another small helping of the alige, the guard explained that coconut crabs are becoming more scarce, despite the fact that they are difficult to catch, much like the other local delicacies. The dorado fish, for example, is captured in the strangest fashion: in mid-air, while pursuing its bait: a live flying fish soaring over water. 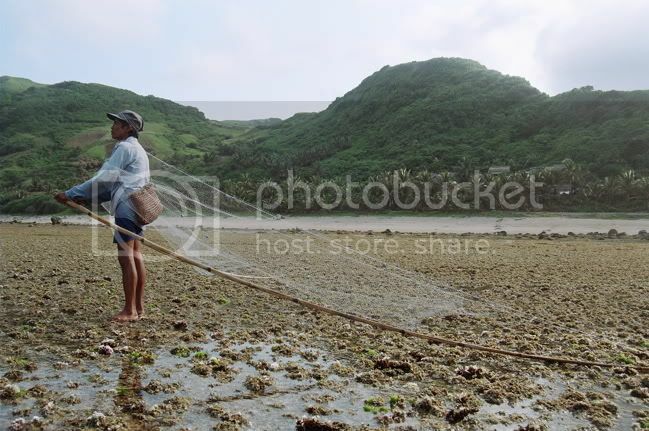 But there is another method of fishing which is unique only to the islands involving patience more massive than the whole of Batanes. 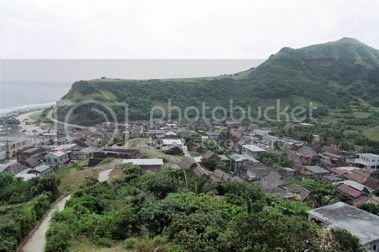 After exploring the entire length of the communal pasturelands of Mahatao, where untamed horses and cattle run free, I decided to descend to the fishing village of Diura, which looked out on the tumultuous western shores of Batan Island. A number of small falowas were parked on the beach. 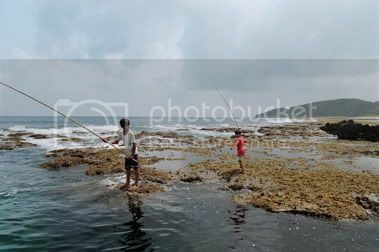 At low tide, when the sea begins to withdraw, local fishermen exhaust the afternoon until its last remaining light to catch small fish pushed by the giant waves onto the shallow exposed stone flats which extends far into the sea. These catchers of fish carry an unusual contraption which makes them look a little like resting dragonflies. On both hands are the ends of long shoots of bamboo, bound together by a net resting over the shoulders. Standing for hours with amazing patience and perfect stillness, they pay close attention when a huge wave comes crashing into the exposed shore. When the bubbly froth of the breaking wave recedes, they cast their curious fishing apparatus, and pick up whatever may be caught in its net: mostly colorful fish no larger than two fingers better left inside aquariums than on dinner plates. I left Diura that afternoon with a profound admiration for the local folk’s absolute devotion to their method of catching fish. To me, it looked more like a form of art steeped in ritual, rather than a cunning hunting technique. Leaving the province was a painful thing to do. One almost hopes for an unexpected typhoon to force flights to be cancelled. 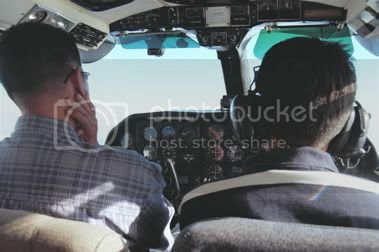 But for the first time in my seven days, as I sat behind the two pilots of my plane, I saw the summit of Mt. Iraya. One could not ask for better weather. One of the pilots asked if everyone was ready, and handed out candies to the passengers. Outside the plane, a man in raggedy clothes was armed with a small fire extinguisher. The plane started with a pop, and shortly, we were cruising at the altitude of kites. 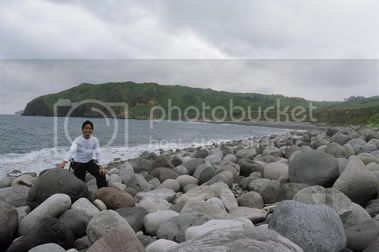 These are the Batanes Islands. That is all there is left to say after the failure of all metaphors. you didnt hook up with sina roy, kuya mar, don? Very nice Alman, it's magazine-ready down to the layout :) The 5th pic (aerial shot of the jagged coast) reminds me of your slide presentation at the DAP in Tagaytay in 2005. Everything looked so familiar and so beautiful. Thank you so much for giving us a taste of home. I showed your lj entry to my mom, a native Ivatan, and she was teary eyed. Ang galing. You should make a Travelogue or travel-blog thingy - eh, I know you get the drift... but just a thought... but really you should! I did! 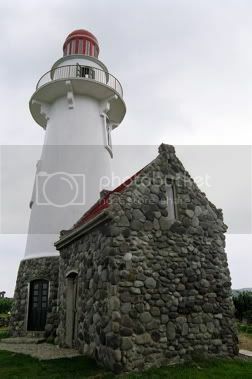 I actually read all your entries re: Batanes... well, that and everything else you post here in LJ. Hehehe... Now, I wouldn't want you to think of a cyber-stalker here but I may come close ;) Hala ka. BTW, what travel magazine? My relatives are all dying to read your entry! Funny how they have been here for more than 30 years yet they miss Home. Thanks again. I'll be lurking around. Ha ha!